Sharing your hard-earned dollars with a cause close to your heart can be a very humbling, gratifying gesture – and there are many ways to maximize the impact of your donations. This month’s Wealth Management Insights explores a few techniques you can consider to make thoughtful, strategic charitable gifts. The professional advisors in your life can help you develop and realize your charitable goals. A financial advisor can help you define your charitable intentions and introduce you to planning concepts and techniques. They can also connect with other professionals in your life – for example, your attorney or certified public accountant – and coordinate the team’s efforts. An attorney can help align your overall estate plan with your charitable goals. In addition to recommending estate tax- and income tax-efficient estate planning, an attorney can recommend an appropriate entity for your charitable giving. A CPA can also recommend income tax-efficient strategies as well as run tax projections to evaluate which strategy makes the most sense for your charitable intentions. Careful planning can help ensure your gift has long-term benefits. Charitable trusts allow you to make a future charitable gift right now. A charitable lead trust makes annual payments to a designated charity for a period of time, and the remainder of the trust is distributed to designated beneficiaries at the end of the term. A charitable remainder trust is the reverse; it provides income to you and/or your beneficiaries for life or period certain, and the residual balance transfers to a charity at the death of the last surviving beneficiary or the end of the trust’s term. Families that want to establish a legacy can consider donor-advised funds or a private foundation. While a private foundation can make a significant charitable impact, they are often very expensive to establish and maintain. Donor-advised funds allow families to recommend which public charities receive grants – without the operating expenses of a private foundation. As tax season approaches, it’s important to note IRS charitable deduction limits. You cannot deduct more than 50% of your adjusted gross income, and 20% and 30% limitations may apply in certain cases. Be sure to factor these considerations into your year-end discussions and planning with your tax professional. Think broadly when it comes to giving back. Take advantage of your employer’s charitable gift matching opportunities, if available. Be sure to research any nonprofit you’re considering donating to and verify it qualifies for a match under your employer’s guidelines. Enhance your monetary donations by volunteering for the organization. Many charities welcome additional hands around the holiday season! Consider giving different assets to achieve your charitable goals. For example, families can donate land while continuing to live on it through a remainder interest trust. In this vehicle, a donor makes an irrevocable gift of an interest in the family property while retaining a life estate. When the donor dies, ownership transfers to a designated charity. As 2016 draws to a close, consider giving back to a cause that matters to you. Before making a charitable gift, consult your Baird Financial Advisor and other professional advisors in your life. 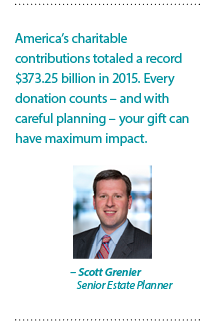 They can help you identify the best way to maximize the impact of your charitable gifts.